Tacos are one of my family’s favorite go-to dinners on busy nights. Our family taco nights are an opportunity for us to make a quick, tasty dinner so that we can enjoy spending time with each other instead of hanging out in the kitchen. Old El Paso offers a variety of seasonings, sides, sauces, and meal kits as simple solutions for a night of catching up with the family over a delicious taco dinner. To satisfy your Mexican style cravings, the Old El Paso line up of products includes chilies, dinner kits, dips and sides, enchilada sauce, refried beans, seasoning mixes, shells, taco sauce and salsa. You can make your family taco night a fun evening with these activities from the world’s only family taco night game, El Tacodor. You’ll have access to fun trivia and games, as well as sweepstakes and more! Print this coupon for $.60 off any 2 Old El Paso products to save on family taco night at your house. And Old El Paso is part of the Box Tops for Education program, so you can support your child’s school, too! 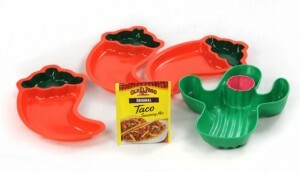 Old El Paso would like to give one of my readers a family taco night of their own. This giveaway is open to all US residents ages 18 and older and will end at 8 p.m. CST on Thursday, November 18, 2010. Only one entry per person allowed. The e-mail addresses I collect in this giveaway will only be used to contact you if you are a winner and will never be publicized. Disclosure: Old El Paso and My Blog Spark provided me with a family taco night gift pack as well as one to giveaway on this site. Please know that the opinions expressed here are 100% my own and were not edited by Old El Paso, My Blog Spark, or their affiliates. My kids LOVE taco nights! Thanks! Our family loves taco nights too!